Hello hello and I know what you’re thinking: “Another cookie recipe?” Yes another one, but this time I promise it’s like nothing else in the world. It’s a Blueberry Cookie! Behind the Scenes: Blueberries were on sale that week and this girl over here loves a sale so I stocked up. I froze half and rushed to bake the other half, and after muffins, scones and tarts I didn’t know what else to bake since I was limited on ingredients. 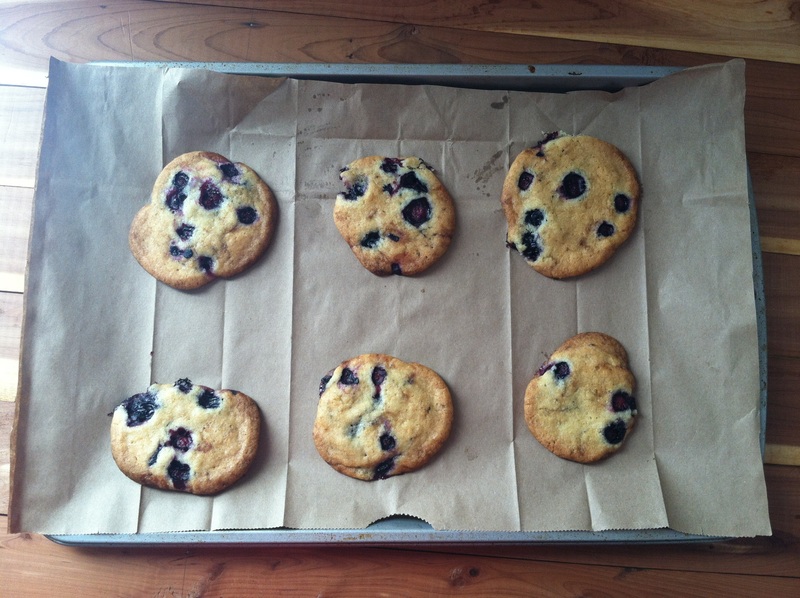 So what had happened was…….I was on Instagram and I saw a nice gal who I don’t even know who had a cookie on her shirt and random fruit animation on her pants, how this gave me the idea for blueberry cookies, we will never understand, but it did. Adjustments: Once again, the problem with fruit is that there’s so much water in them; so you always have to keep a heads up for that, but I put the batter in the refrigerator for almost an two hours (yes I forgot about them, but don’t judge me. It all worked out for the best). 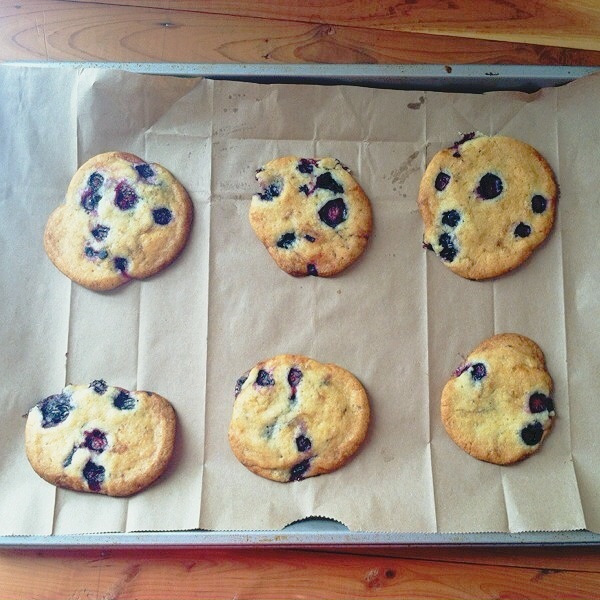 If you really want to you could even freeze them for tempo hours that way for sure you keep those blueberries from bleeding and mushing up your cookies. If you have a choice I vote for freezer. 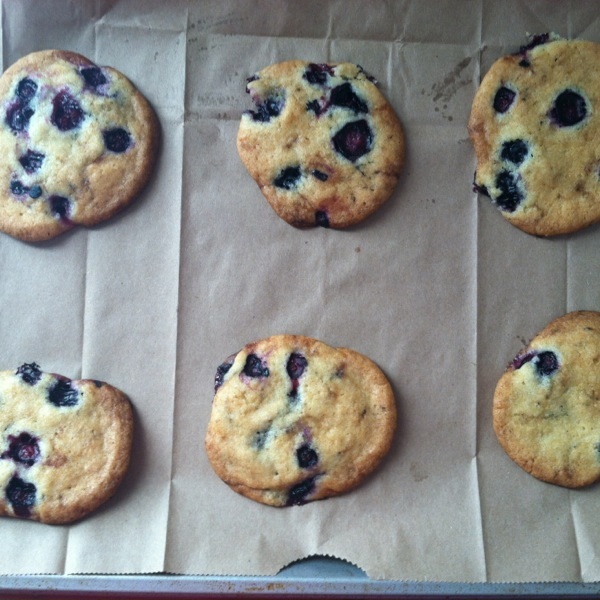 I used a basic sugar cookie recipes and simply added blueberries. Remember: if your using frozen blueberries don’t thaw them. They will bleed and dampen the cookie. Size Does Matter: I usually like the delicate small tea sized cookies, but this time with the blueberry cookies I wanted those babies big and attention grabbing. I just think it looks cuter that way and you can see the blueberries more. If we’re talking about aesthetics then I think bigger in this case is better. I also think you could roll these in a wee bit of simple white granulated sugar to give it a stain-glassed look. The sugar never 100% melts so the somewhat translucent look always gets me all giddy. I’m a simple person in case you can’t tell. Hehehe. Ta-Ta for Now:Well I’m off to watch Girl With the Dragon Tattoo, I hope you all like this recipe and put your own spin on it. I suggest the same thing when it comes to freezer if your going to use a different berry. Some alterations you could make is creating a raspberry cookie. If your going to do that maybe use a lemon cookie recipe instead; I’m seriously considering doing a lemon raspberry cookie post now. Also as you might of seen, this makes a lot of cookie and I got a bit lazy towards the end and crowded the last cookie sheet pan; the cool part was when I took some of the cookies off the cookie sheet pan it looked just like the U.S. State of Florida and I thought that was awesome! In a large size bowl, cream together with the hand mixer the butter and sugar until they are light and fluffy. Gradually mix in the dry ingredients until fully combined. The mixture should be thick but fluffy as well. 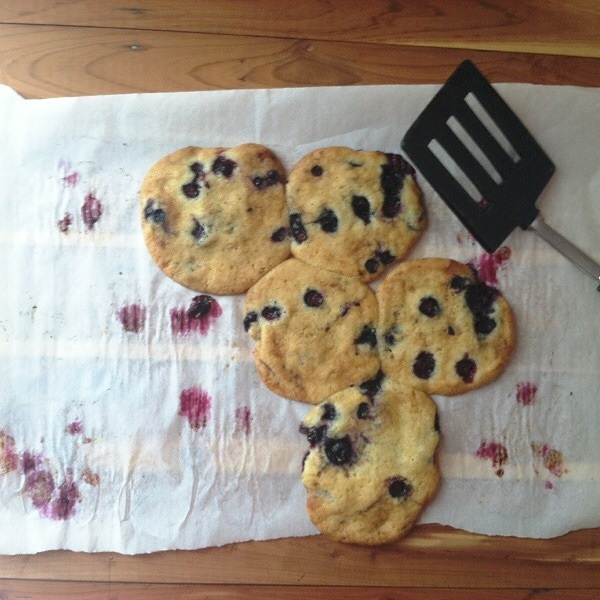 With a spoon mix in the blueberries, if you are using frozen blueberry make sure they are dry as this can water down the batter and cause a great big mess. I always use an ice cream/cookie scooper, if you don’t have an ice cream/cookie scooper then a kitchen spoon or tablespoon measuring cup will be fine. Bake for 7 – 10 minutes, leave the cookies in the pan for another 5 minutes outside of the oven and the place them on a cooling rack. These are unlike any other cookie, so don’t eat them with anything; just enjoy them on their own. Like a stay-cation in your house when your roommates are gone for the weekend.